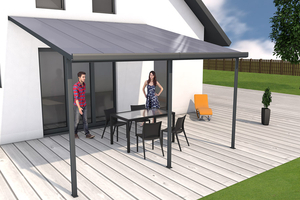 Cover a terrace, build a carport, create pergolas or cover courtyard areas: With Gutta’s handy assembly kits, you can do it in no time. 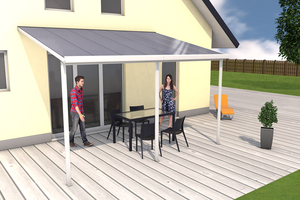 You will receive a complete kit, including mounting material, that will allow you to begin immediately and guarantees a straightforward, quick, and flexible installation process. 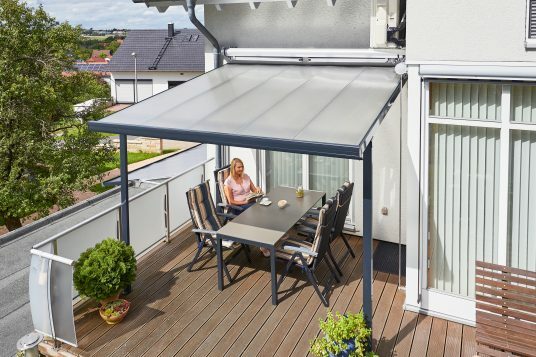 Allow your imagination to run wild: Gutta’s assembly kits, which include mounting material, make installing patio roofs and other types of roofing around the house easy, uncomplicated, and safe. 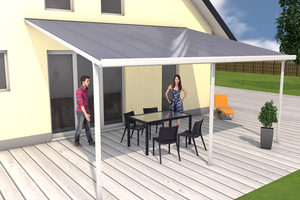 With our patio roof kit and some craftsmanship, you can install roofing in true professional quality. 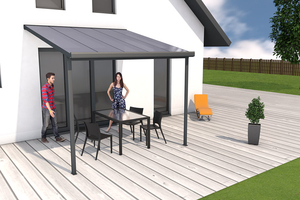 Our durable, sturdy design offers a variety of possibilities for long-term roofing solutions around the house. In the long run, quality always pays off. 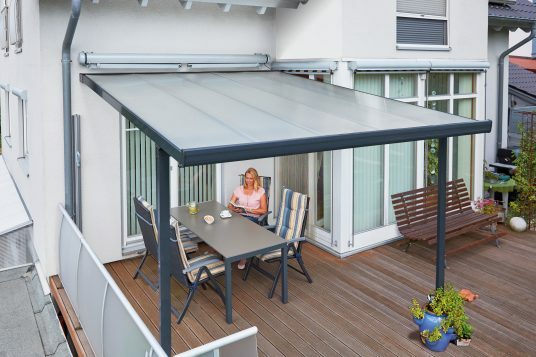 Take Gutta’s terrace roof kits for example – a professional, durable quality roof. 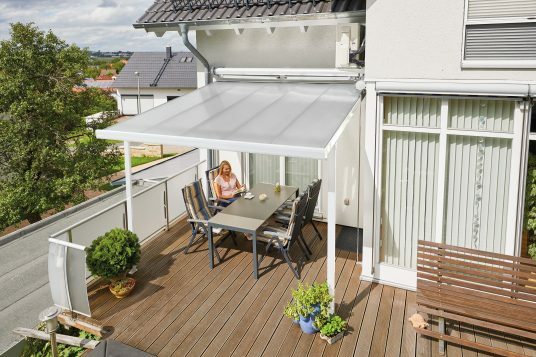 Made of polycarbonate multi-wall sheets, the metal frame construction features a transparent roof and is fit for a wide variety of uses. It also withstands wind and weather. 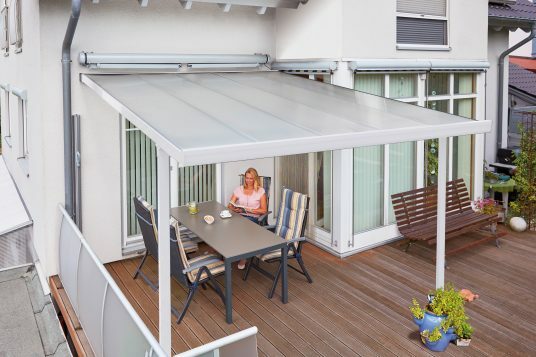 Moreover, thanks to their narrow profile cross-sections, all Gutta roofs are particularly elegant and slim. 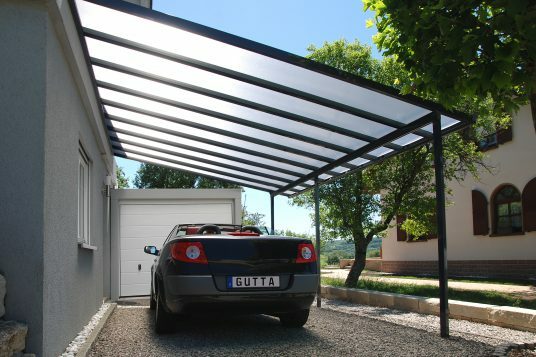 Simply select from a roof depth of 3 or 4 metres according to your plans, and you’re ready to go. The columns, girders and rafters are all made of durable aluminium. All visible metal profiles are powder-coated ex-works in white or anthracite, keeping your roof in peak condition for years to come. An integrated gutter is also included. 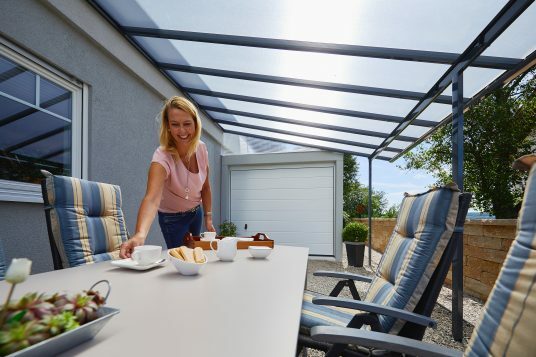 The terrace roofing further offers great stability, withstanding snow loads of up to 150 kg / square metre effortlessly. The roof is made of 10 mm multi-wall panels, allowing it to retain its brilliant appearance over many years. 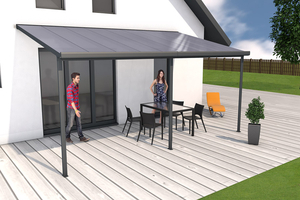 Gutta roof kits let you do it all – not only terrace roofing. 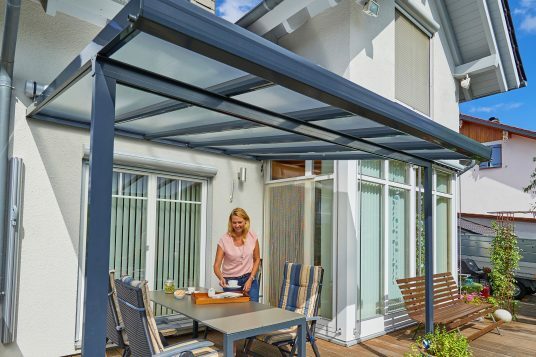 Whether they are intended for a terrace, patio, pergola, carport, courtyard roofing or another project, our attractive sets will let you accomplish your project easily and quickly. And you can rest easy with a ten-year warranty (as defined in the terms). Top quality pays off permanently. 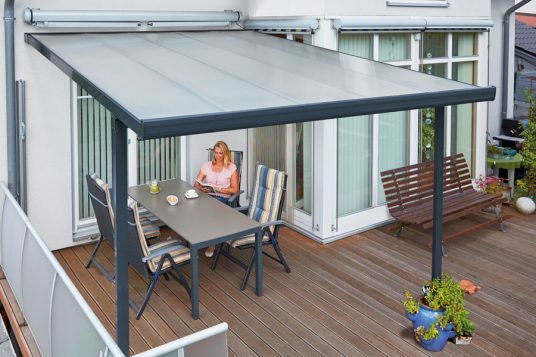 With Gutta kits, your terrace roofing is guaranteed to be a success. The kits also give you great flexibility; you can adapt assembly to fit your needs. 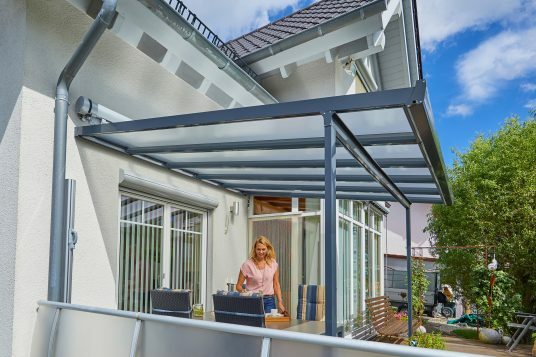 Both the crossbeams and the posts are adjustable up to 60 cm. Their variable ridge height and adjustable support posts provide even greater flexibility. That’s not all: Our 120 cm expansion module allows for a theoretically infinite extension of models that are 5.46 m in width. 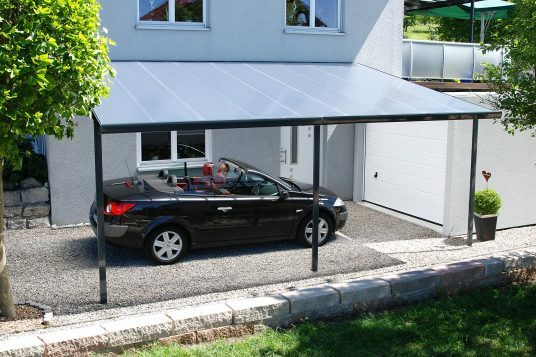 This leaves you free to use the entire length of the building as a parking space for cars, bicycles or gardening equipment. 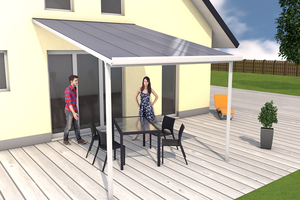 The module consists of a front support (purlin), rain gutter, wall bracket, two rafters, two plates and a jamb, and can be built into the middle of 5.46 m wide two-piece models. + 6 modules: 5.46 m + 6 x 1.2 m = 12.66 m, etc. Note subject to technical changes. Data according to manufacturer’s specifications.